In my quest to make weekend breakfast more often this year, I’ve returned to making scones more often. 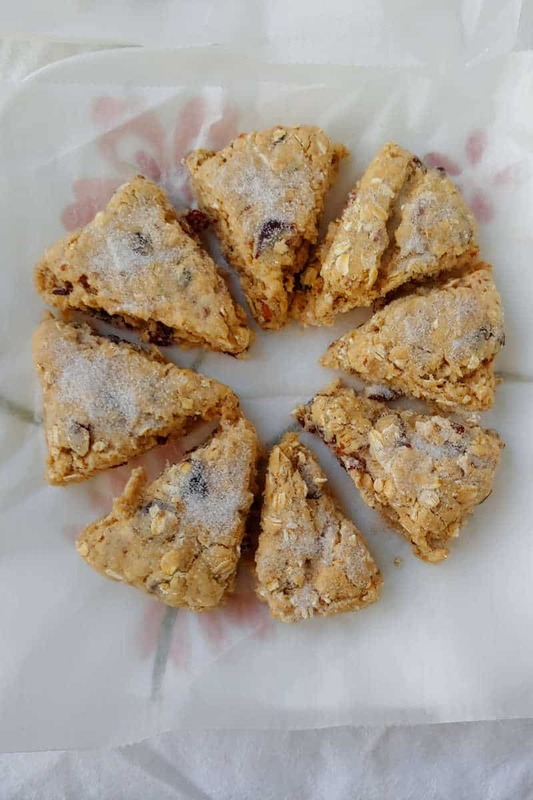 This time, I decided to revisit the Cranberry Oat Pecan Scones that I made 8 years ago as my 367th and final recipe of 2010, when I started this blog. 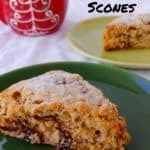 I am so glad that I made these again, because they are just about everything that I want in a scone. They are toasty outside with a tender inside. Dried cranberries make them perfectly sweet, particularly if you sprinkle sugar on their tops before baking. 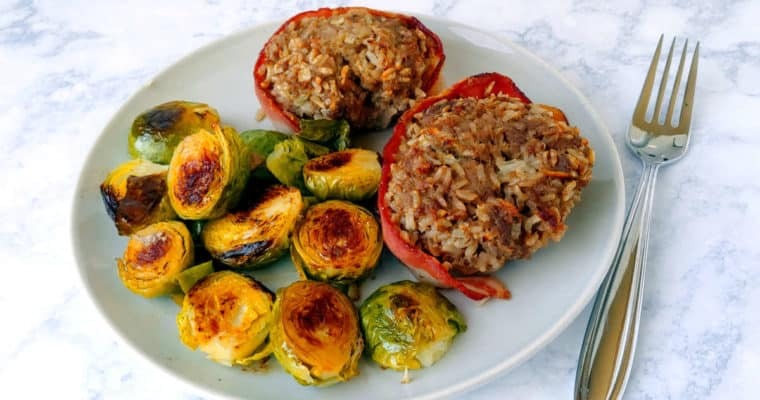 Oats and pecans make them a little hearty. Impatient to try them? Jump to the recipe now. 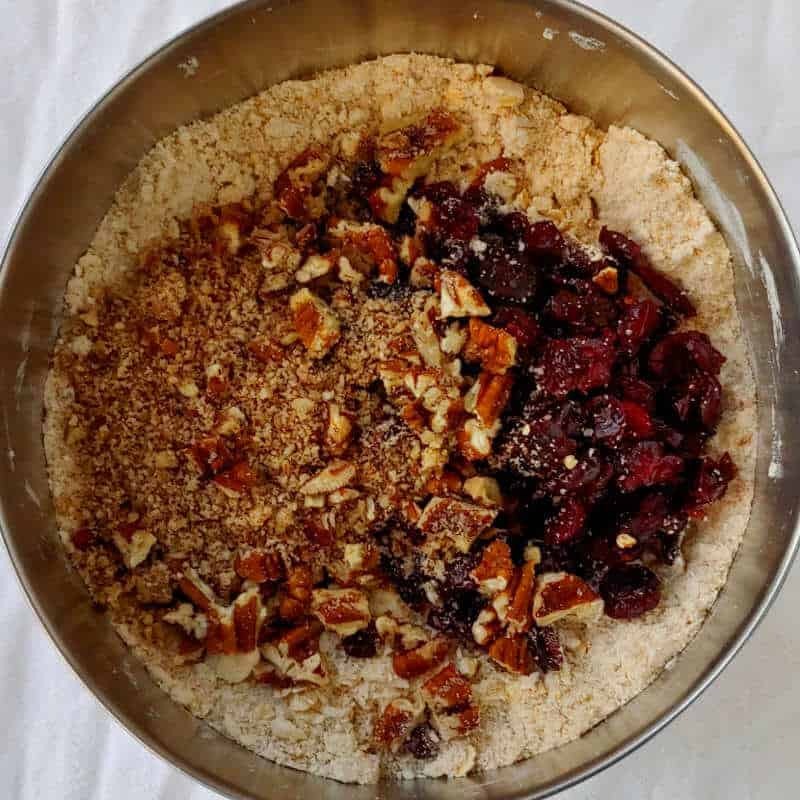 The recipe I came across from King Arthur Flour was originally called “Christmas Scones,” I suppose because they have dried cranberries, pecans, and oats nestled inside. 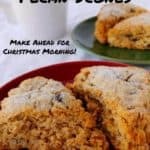 Perhaps these scones are filled with food that other people traditionally ate at Christmas, but they by no means were represented in my Christmas past. As a kid, Christmas mornings started at 6am (at the latest) with little chocolate mini donuts first thing while we opened presents. 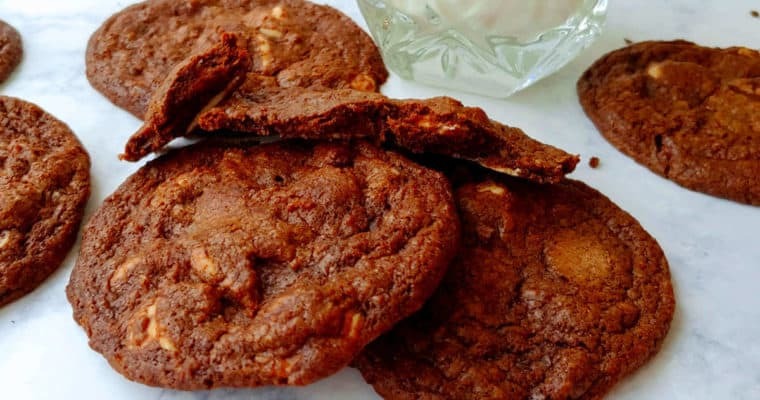 Sometimes we’d follow it up with a hot breakfast for all dozen of us; other times, we’d eat cookies and other homemade snacks. Then we’d have our main meal (lasagna, although we’re not Italian) around noon or 1pm. Later on we’d have leftover lasagna, chocolate pie, pecan pie, other pies, or chocolate chip cookies, and snacks like sausage balls or summer sausage and crackers. Nowhere in my Christmas past were there cranberries. Once we grew older, we moved farther away from my grandparents and just had Christmas at my parents’ home. We would sleep later. And with just 4 or 5 of us there, we didn’t want to spend a lot of time making breakfast on Christmas morning, so we dropped our elevensies. Our Christmas dinner and desserts haven’t varied, but we try adding different things to the mix each year. I’ve always enjoyed baking, so I’ve made us various other holiday recipes as I read about them. 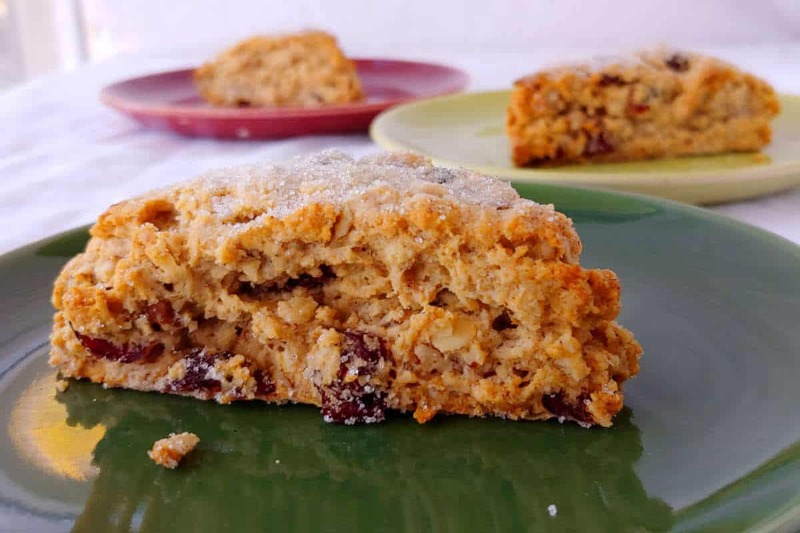 One year, well before this blog, I made stollen. 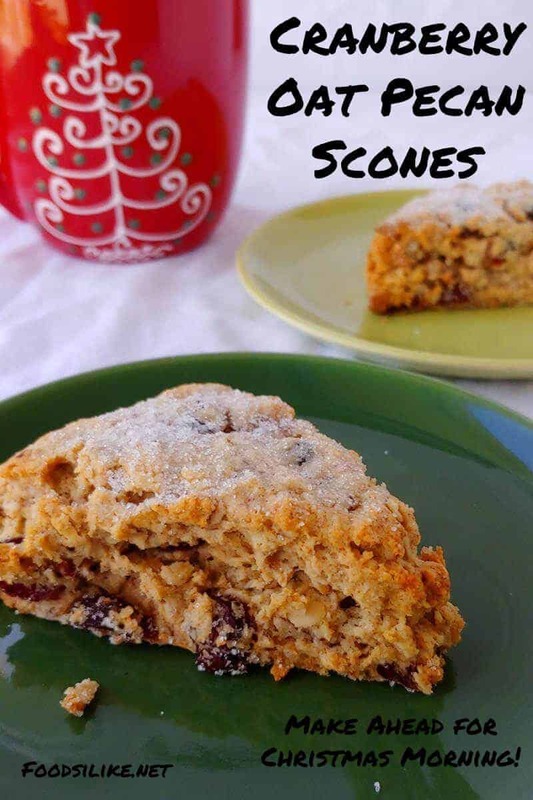 The year I did my 365 recipe challenge, I made these scones as recipe #367. In 2010, I made them from scratch on Christmas morning. I wouldn’t do that now. Much like these cinnamon rolls, I would make these scones a few days in advance and freeze them to bake fresh on Christmas, just after the sun comes up. I’ve always said that making scones is easy, but it does take a little getting used to. 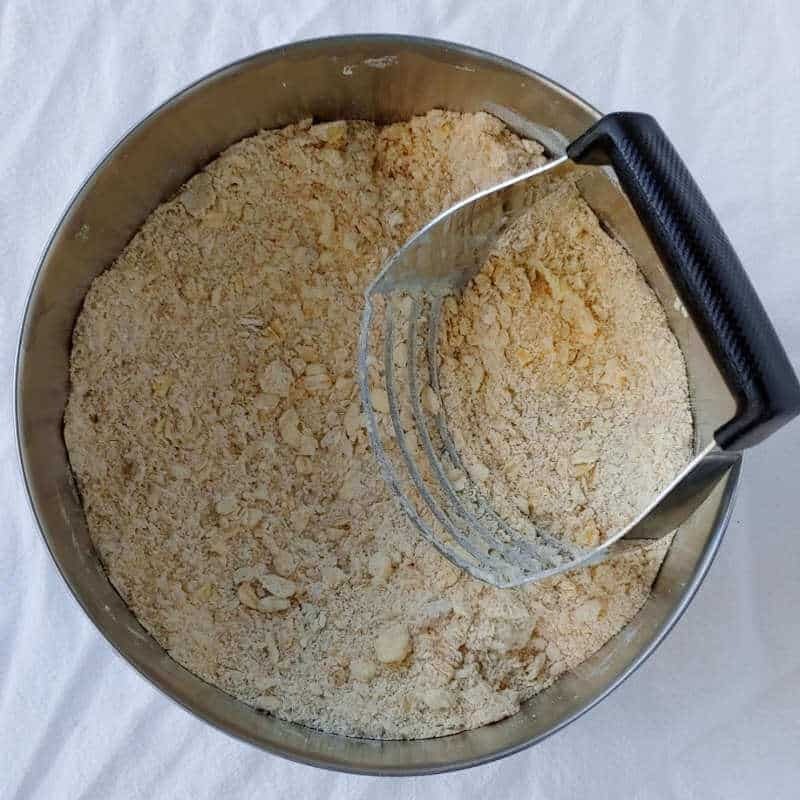 Mix together your dry ingredients – so, flour, oats, brown sugar, baking powder, baking soda, and salt. It doesn’t matter if you use old-fashioned or quick oats, as long as they’re not instant. Steel-cut oats will not work here; they’re too thick. Your butter is supposed to be cold when you use it because it makes the scones rise and hold their shape better. 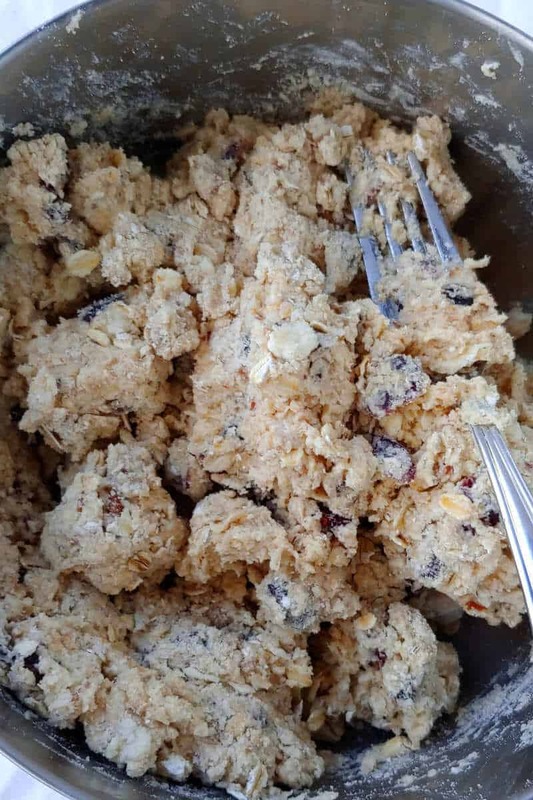 However, if you’re going to freeze your scones before you bake them, you can have the butter softer, which will make it easier to work into the dry ingredients. Add the cranberries and pecans, then toss to combine. Next, add the buttermilk. I usually use sour milk, which is milk that you’ve added vinegar or lemon juice to so that it curdles. This is important because it needs to react with the baking soda. Yogurt is another good option. Greek yogurt is too thick, but you could thin it with milk until it’s about the consistency of plain yogurt. Use a fork to stir in the buttermilk and toss it with the crumbs. A fork works better than a spoon or spatula because it moves the crumbs without stirring the dough as much; wet dough also doesn’t clump onto a fork the way it does on a spatula or spoon. 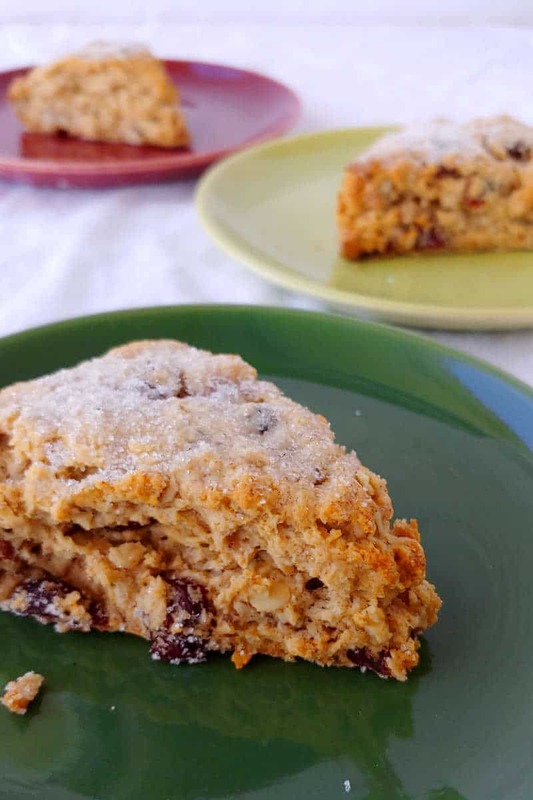 The dough will be crumbly, but you don’t want to stir it too much or your scones will be tough. It’ll seem like it needs more liquid, but don’t add extra. Once your dough begins to clump together, use your hands to gently mold it together the rest of the way. Turn it out onto a floured surface, and use your hands gently pat it into a ball, sticking any stray crumbs back on. Divide it into two. Pat each ball into a 6-inch round. Sprinkle it with sugar and pat it in, then cut it into 8 scones. A bench scraper (affiliate link) (I adore mine, which is this one) works amazingly well here, although you can also use a knife. 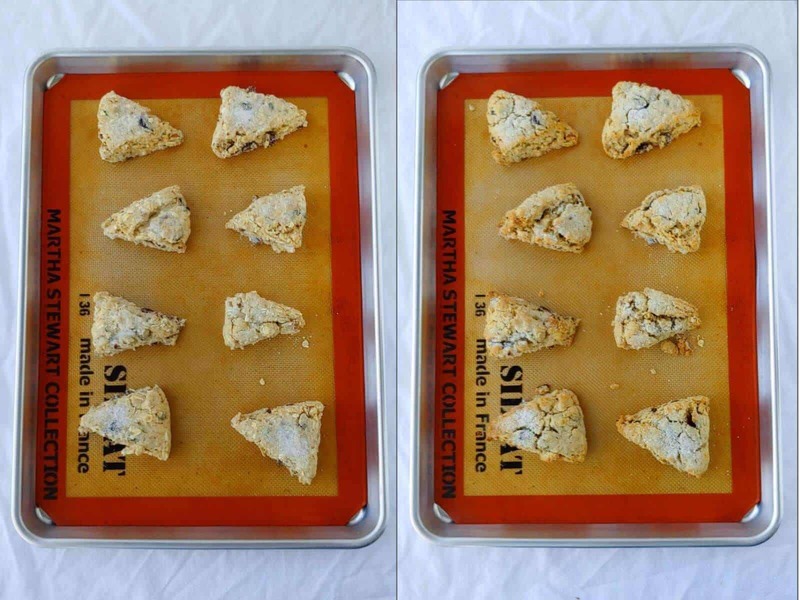 Place each scone on a greased or parchment-lined (or Silpat-lined) baking sheet. Or, freeze them at this point. Bake the scones at 375F for about 20 minutes, until they begin to brown. If you insert a toothpick into a scone, it will come out clean, or with a few crumbs on it. I strongly recommend freezing these scones! I freeze most scones that I make. 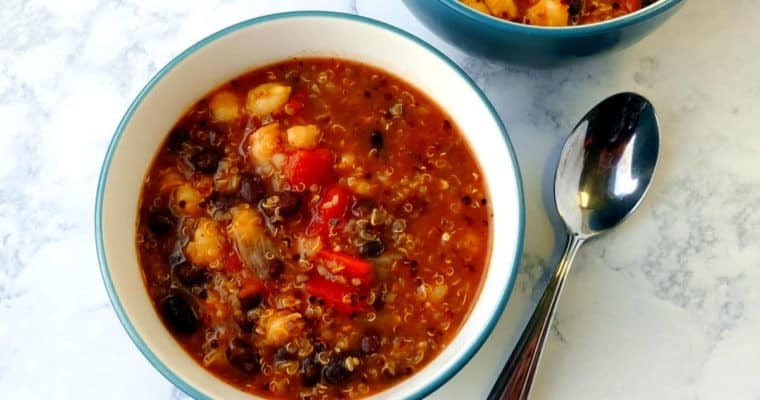 It’s a wonderful way to have a fresh breakfast on a weekend or holiday morning without having to actually cook just after you wake up. 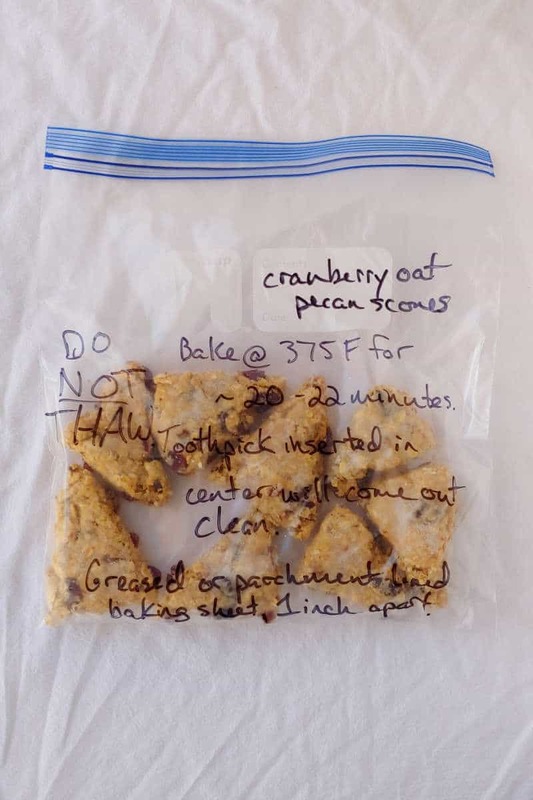 After shaping and cutting the scones, place them on a plate lined with waxed paper, parchment, or plastic wrap. (The paper/wrap helps you remove the scones from the plate once they’re frozen.) You can crowd the scones together, but don’t let them touch. Place them in the freezer and freeze them. I would guess about 2 hours, although I often forget mine overnight. Once they’re frozen, remove them from the plate and place them in a freezer bag. Be sure to label it with the baking temperature and time so you don’t have to look it up later. When you want to bake the scones, just preheat your oven to 375F. Once your oven’s hot, remove the scones from the freezer and place them on your greased or parchment-lined baking sheet. No need to thaw them! 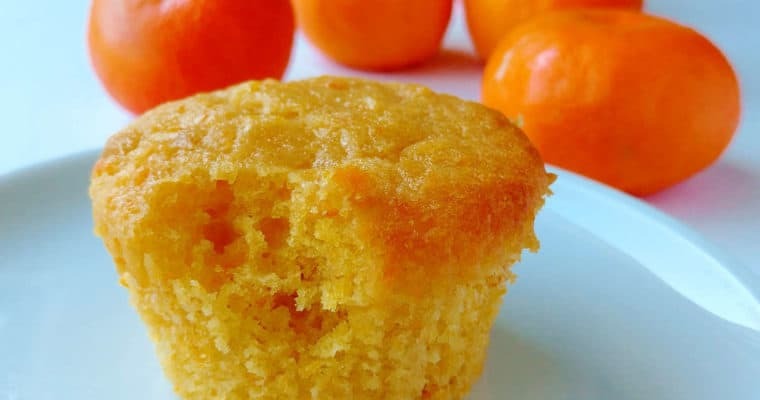 Bake them for an extra 2-3 minutes. I think these scones are sweet enough to serve on their own. 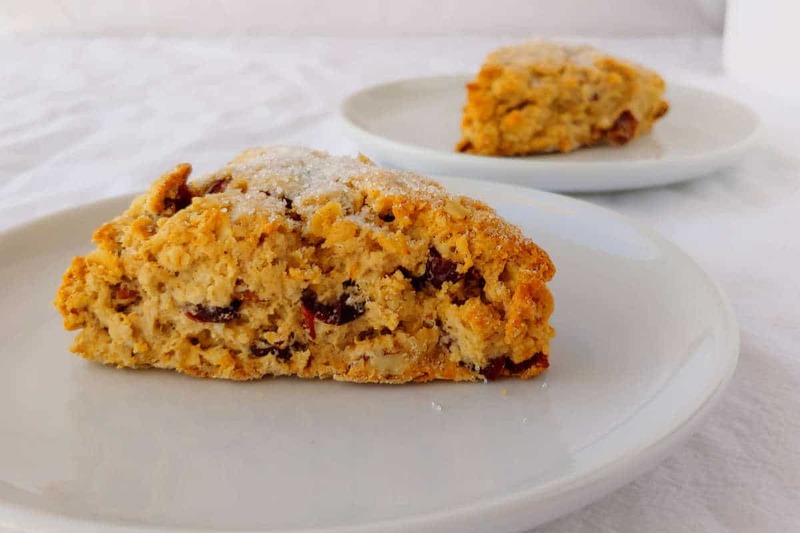 With pecans and tart but sweetened cranberries, the scones have lots of flavor, and are sweet enough to serve on their own, without jam or anything else. Butter might be a nice addition (like buttering a biscuit), if you’re into that thing. I’d serve along a nice cup of coffee or English Breakfast Tea (my favorite to have with scones if I’m not having coffee). Or maybe a nice hot cocoa if you’re serving Christmas Scones on Christmas morning. 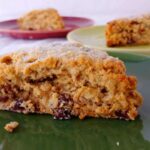 Cranberry Oat Pecan Scones are toasty yet tender, hearty and delicious. 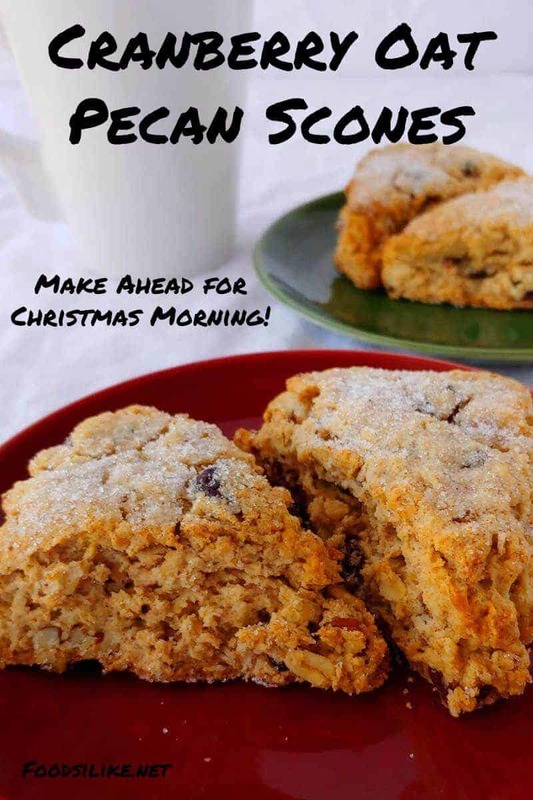 Make and freeze in advance, then have a freshly baked breakfast on Christmas morning! Mix together flour, oats, brown sugar, baking powder, baking soda, and salt in a large bowl. Use a pastry cutter or two knives to cut in the butter, until it resembles crumbs. Stir in cranberries and pecans. Stir in the buttermilk. Use a fork to toss the milk and crumbs together gently, until it forms large clumps. Don't mix it too much. The dough will be crumbly. This will be ok.
Press the crumbly dough together with your hands, then turn it out onto a lightly floured surface. Press the dough together again with your hands, but handle it gently. Once it's a single mass, divide it in half. Gently form each ball of dough into a flat around about 6 inches in diameter (1 inch tall). 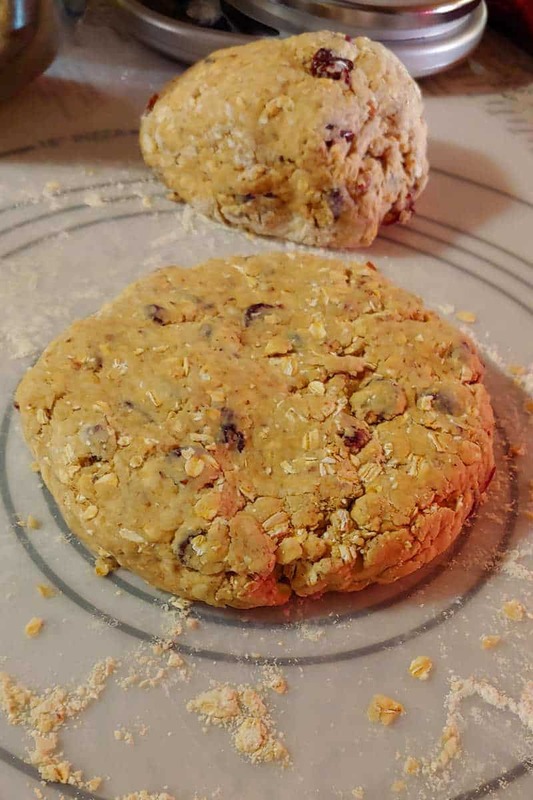 Separate scones onto a greased or parchment-lined baking sheet, leaving 1 inch of space between them. Bake immediately, or freeze to bake at a later date. 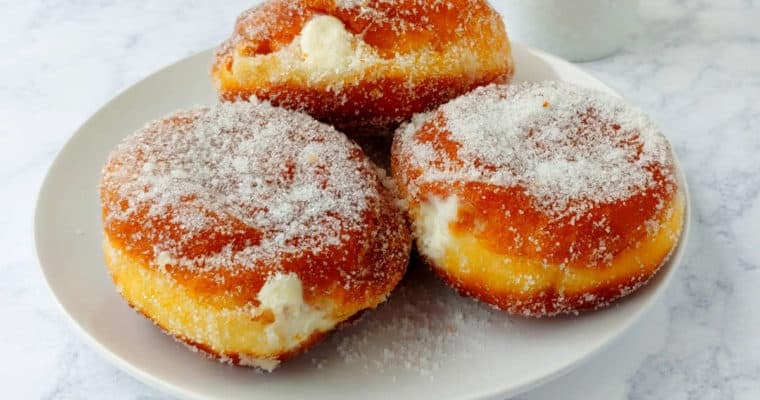 To make sour milk, combine 2 teaspoons of vinegar (overpour it slightly) with enough milk to equal 3/4 cup, and then it set for 10 minutes while you prepare the rest of the ingredients. I prefer freezing these for a holiday morning. Freeze until solid (a few hours; I often do overnight), then place in a freezer bag. Label it with the baking time and temperature. Bake them for an extra 2-3 minutes directly from frozen; do not thaw.